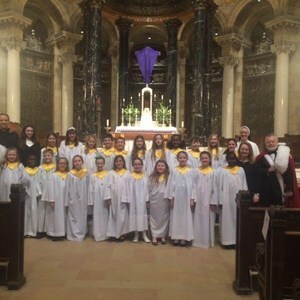 All children in the Saint Michael and Saint Mary parishes (ages 10-14) are welcome and encouraged to join Chorus Angelorum. We are focused on teaching religious music making for the youth of our parish. We come together to pray, learn, understand and grow in our love of the church and the liturgy. This includes learning more about our faith through the liturgy, chants, classical and modern works, and proper singing techniques. A singing commitment is required for both rehearsals and Sunday Masses. Once a month during the school year, the children will sing a mass at the Church of Saint Michael or the Church of Saint Mary with 1-2 special Masses hosted outside of the parish. Special programs are undertaken with the intention of enriching our Catholic culture. Auditions are not necessary, but commitment to attendance is. A maximum of over one missed Sunday Mass in Fall Semester and two missed Masses in Spring Semester will excuse your student from continuing the choir year. It is important to review your children’s and family’s activities for each semester prior to signing up for the choir. If your student has to miss a rehearsal/Mass, an email must be sent to childrenschoir@costm.org to inform the director the day before rehearsal or at least two weeks before a Mass. We hope that your child will sing with us! Registration is ongoing throughout the year. To register, please fill out and return a registration form found at the St. Michael parish office or contact Anna Wahl at childrenschoir@costm.org for a digital copy.